There are quite a few methods for how to bond concrete, or how to bond new concrete to old concrete, and it depends on the application which will be best. Make no mistake that the world of concrete goes incredibly deep and there are many applications where you really should be speaking with a professional concrete worker as opposed to taking the job on for yourself. On the flip side of that coin there are many times where you just have a small or simple job to do and you just need a little basic instruction. That is what this article is intended to help you with. 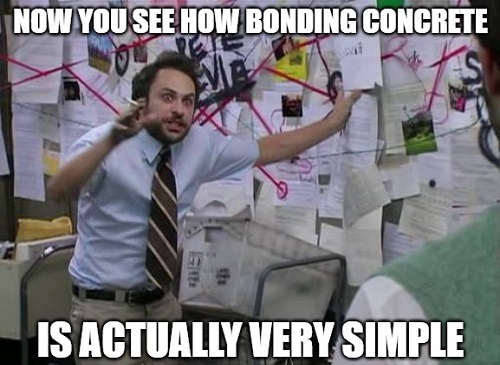 There are so many potential variables involved with learning how to bond new concrete to old concrete that it would be impractical to consolodate this information into one page. Instead this article will attempt to provide you with a working understanding of some of the more popular products, chemicals and processes for bonding new concrete to old concrete. If the old concrete layer is dirty, or has loose debris or calcium buildup, or has any oils saturating the surface, then this will likely prevent your new concrete layer from bonding properly. To resolve this you will need to go through a series of steps to prepare the old surface for bonding. The first would be to rinse or pressure wash the area that you will be bonding the new concrete. For many novice concrete workers this might be all the surface preparation they do...which would be a mistake if you want the new concrete to bond to the old concrete as well as possible. 1) Remove grease and oils - Many concrete surfaces will have oil in the top layer and this will not likely be removed with rinsing or even with pressure washing. Use 1/2 cup of TSP (trisodium phosphate) to one gallon of warm water and apply to concrete area to be patched. Use a stiff bristled broom to work the TSP about the surface of the concrete. Use proper safety clothes, gear and eye protection as the TSP mix is a strong base, which we will utilize in a future step to neutralize after the acid wash stage. If the oils are too deep for a surface treatment like TSP then you could try soaking the area with varsol which will absorb into the surface and break down the oils. Use something absorbant like cat litter and sit it on the varsol until the floor can be swept dry. Failing this working to remove oils you will need to cut or chip out the oil soaked concrete to be able to get a good bond with your new layer. 2) Acid wash - While the TSP is useful to remove grease and oil that acid washing will not remove, TSP is not enough by itself to prepare concrete for bonding. Acid wash, which is one part acid mixed into seven parts water, will strip away loose portland and calcium that might be on the surface of the concrete. You must remove the oils before acid washing or the acid burns and etches the oil into the concrete surface. Working with acid, like muriatic or hydrochloric acid, is incredibly dangerous. You must be sure to use protective clothing, full arm gloves, safety glass and a respirator when working with acid. It is better to be safe than sorry, and the dangerous nature of some of these products is why, for the most part, concrete work is best left to professionals. 3) Rinse and neutralize the concrete - Once you have applied an acid was to the concrete, the concrete now becomes very acidic and if you apply a concrete patch over this very acidic concrete you may very well find that the patch fails to bond correctly. In order to neutralize acid on concrete you can simply sprinkle baking soda over the affected area and then rinse thoroughly before applying a new patch. In order to be cautious I also prefer to give the concrete another TSP wash after acid washing and neutralizing to make sure the concrete is fully clean, neutralized, rinsed and ready for the bonding slurry. It is very important that the pH of your old concrete and new concrete are fairly similar. Failure to neutralize your old concrete after acid washing could result in a breakdown of your bonding layer. 4) Apply a bonding slurry - A bonding slurry is a mixture of water and portland cement that is mixed to a consistency of soft butter. This mix is then pasted onto the old concrete right before you are ready to apply your new concrete layer. You can make a bonding slurry out of simply portland cement and water, like has been used for centuries to bond cementitious layers, or you can use a modified slurry by adding a PVA or latex additive to the portland replacing the water component in part or in whole depending on the application and materials being used. 5) Apply the new concrete layer - Before you apply a new concrete layer, or even before you apply a bonding slurry, you need to ensure that your base concrete layer is damp. This condition known as SSD, saturated surface dry, refers to a concrete substrate that is completely and thoroughly saturated with water, but has no pooling water on the surface. Failure to have the base concrete layer SSD, or worst of all simply having the old concrete be bone dry before you patch over it, will almost certainly result in a failure of the new concrete to bond with the old concrete layer regardless of what other process or bonding slurry that you use. Notably there are some bonding adhesives which must be applied to dry concrete, and these would typically be epoxy based bonding agents, in which case you should follow the directions form the manufacturer. 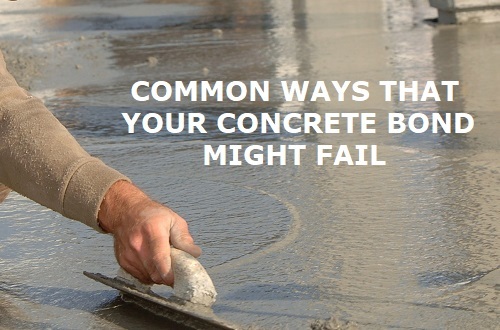 So now that you have a much better understanding of the general process for how to bond concrete it is important to consider a few ways in which you might have a problem. The first is that your existing concrete surface needs to be rough. If it is very smooth then this will prevent your new concrete layer from bonding as well as it should. Acid washing helps to roughen the surface of concrete somewhat, but for really smooth concrete that you need to bond to then you might need to scarify or chip the existing surface with a chipping hammer in order to create a surface rough enough to bond to. You also might find that you need to cut the concrete in some areas and this is because concrete can not be feathered out to a zero thickness. Concrete any thinner than 3/8" thick has the potential to chip and break away easily so you need to cut or grind the edges of your patched area so that the new concrete patch will be a minimum of 1/4" or so in all areas. Concrete as thin as this needs to be modified for applications like this. A traditional concrete or mortar might be able to go as thin as half an inch or so. With latex modified concrete 1/4", or more with special aggregate blends and high solids SBR latex or epoxy, can be achieved. For the average person mixing sand and portland cement together you should aim to have your concrete around half an inch minimum in thickness. Polyvinyl Acetate - Polyvinyl acetate, or PVA is white glue that can be mixed with portland and water to create a slurry that is universally compatible with various concrete applications, at least more so than other bonding adhesives. When added to a slurry mix, replace 10% of the water that you are using with a PVA and paint onto damp concrete directly before you are ready to place your new concrete (up to 50% liquid content can be used for bonding slurry). While PVA is easy to work with, forgiving, and UV stable, it is not the strongest concrete bonding adhesive on the market. It also has the potential to re-emulsify in very wet conditions and this can be a problem for some concrete bonding environments. Modified PVA - This modified PVA from Larsen is the product of choice for many professional concrete workers due to the wide range of uses and applications. Similar to the regular PVA, this product is chemically modified to re-emulsify once after initial application. This allows for application to existing concrete followed by a delay before the new concrete layer is added for up to 10 days. This allows additional time for steel, formwork and inspections on larger construction projects. While this modified PVA can re-emulsify for construction process it will not re-emulsify again after this from moisture or condensation so damp locations are not a problem. This would not be the ideal product for constant water immersion. Acrylic Latex - Acrylic latex bonding adhesive is much thinner than the glue-like PVA. Acrylic latex is thin in consistency and looks like milk. When added to a concrete mix it will make the mix stronger, with an increased placement viscosity. It will also be more resistant to water permeability and chemical damage in the finished concrete. When mixed with water and portland cement acrylic latex makes a strong bond that will not re-emulsify like PVA's once it sets. A slurry made with 50% liquid volume using acrylic latex will bond stronger than PVA mixed slurry and will have far greater resistance to water for exterior, below grade, or under water applications like swimming pools. This acrylic bonding agent should not be used in or with concrete that is modified with polymers. This product makes the concrete retain water better so "moist curing", which is conventionally used for concrete curing, should not be done to acrylic latex modified concrete. Acrylic latex should not be used in conjunction with a PVA in a concrete mix - it's either PVA all the way, or acrylic all day. Low Solids SBR Latex - SBR latex, or Styrene butadiene resin latex, is the concrete bonding adhesive that can result in the strongest potential bond when used as a bonding slurry, versus acrylic latex or PVA made bonding slurry. Laticrete is a brand that many professionals trust, that has entire product lines developed for every type of concrete bonding (and waterproofing) application you can imagine. This Laticrete SBR latex is a professional grade product line that you can use for making bonding slurry, or as part of the Laticrete system for setting tile. If you have a larger concrete patching job or you are a professional or semi-professional looking to step up your concrete game, then learning how to work with Laticrete products would be a great move. High Solids SBR Latex - While strongest, SBR latex is also the most UV reactive bonding agent and requires coverage such as with paint or else degradation in UV light will occur. SBR latex acts as an air entrainer in concrete as well as giving a water reducer effect which allows for a more watery mix without compromising the strength. Concrete made with SBR latex will be less permeable to water and more resistant to chemical damage than concrete without this additive. The ideal bonding slurry with SBR latex would be 50% water and 50% SBR latex to make up the liquid volume. This product is uniquely freeze thaw stable unlike most other bonding agents. Similar to acrylic latex, SBR latex will allow the concrete to retain moisture which will, in the long term, increase the strength of the concrete. This does however retard the initial set strength during the first week most specifically, and "moist curing" of concrete modified with SBR should be avoided. What is the significance of the solids content in latex? You want a higher solids content as this indicates a higher concentration of latex. Typically speaking this is measured in percent by weight. A higher concentration of latex means a stronger potential bonding agent, but this also means a more expensive price. The higher the solids content the more difficult and unforgiving the latex will be, and while solids content can be as high as 75% this would be most impractical from a manufacturing perspective due to the high rate of failure. Laticrete 4237 latex additive has 17-20% solids content, where Everbuild 503 premium SBR bond has 38-42%. Other popular brands of SBR latex like Nitobond have 44% solids and SBR latex from Euclid Chemical at 48%. Other concrete bonding adhesives - These examples of concrete bonding adhesives are just that...examples. There are dozens of proprietary products and modified chemical blends sold around the world for bonding new concrete to old concrete. The few listed above do not even provide one example each from the different type of bonding chemicals. 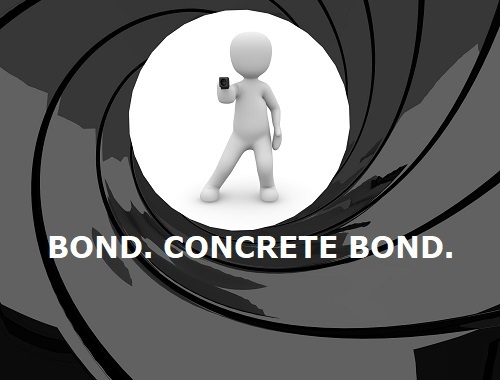 There are also bonding agents from SIKA CORPORATION , BondCrete from Bondall and DRYLOK Bonding Agent . These are only some of the liquid options for concrete bonding adhesives and there are also powder forms with differing chemical compositions. Another popular brand name for concrete bonding products is Nitobond from FosRoc which have an entire line of SBR acrylic, acrylic latex and PVA bonding adhesives. All of this does not even yet introduce the subject of epoxy based concrete bonding agents which could very well represent the most advanced form of concrete bonding in use today...the only thing is that epoxy based bonding agents, even more so than PVA and latex, require an experienced professional to use them effectively. Even experienced professionals can struggle with high failure rates and compatibility issues with epoxy based cement products. Just as with the above example with Laticrete, when you are at the professional level you have to reach out and communicate with the product manufacturers directly. They are the only ones with enough knowledge of their products to know when to use them and what their limitations are. Usually learning a new epoxy concrete system, or even any of the more advanced PVA, acrylic and SBR acrylic systems will require technical training from the manufacturer. In an attempt to put a summary on this very technical subject, and to provide some sort of meaningful takeaway to the average reader looking to learn about how to bond new concrete to old concrete, what you need to know is that PVA is good indoors and outdoors because of resistance to UV light, and can fairly universally be used for bonding new concrete to old concrete with success and without worry of non-compatibility with non modified portland cement concrete mixes. Under water and standing water would be poor applications for PVA's due to the potential for them to re-emulsify and compromise the bond layer. As long as your concrete application has slope and does not pool water then a PVA slurry will most likely result in success. The optimal bonding slurry for PVA is portland cement, water and PVA (the PVA makes up minimum 10% of the water content of the slurry, up to a maximum of 50%). Apply this to a damp concrete surface (SSD) and apply new concrete layer before the slurry layer dries. Include more PVA in the patch mix itself (providing it is otherwise regular concrete or mortar, non-modified) to improve adhesion characteristics. What is the difference between acrylic latex and SBR latex? - The two latex options, acrylic latex and SBR latex are similar, but not identical. Both are less UV stable than PVA with SBR being the least UV stable. Both increase the strength and flexibility of the finished concrete with SBR being a stronger, more abrasion resistant finished product. Both can be used to make a bonding slurry. If you want to use latex in your topping mix or patch concrete then you should not use PVA as a bonding slurry, or in the patch concrete. So what is the difference between these two latex products? The acrylic latex is a lot less refined, and can almost be considered a concentrated tree sap since that is essentially what it is. SBR is that same tree sap but chemically modified for further improved adhesion and strength characteristics. Acrylic latex does not absorb UV but the styrene butadiene resin does so while certain characteristics of the concrete are better with SBR acrylic, it can not be used for direct UV exposure applications. Consider these latex products like a rubber band. When stretched to capacity the SBR latex is more able to withstand the stretching forces, and return to the original shape without permanent damage or distortion. However in direct UV light, much like a rubber band, the SBR latex will more aggressively degrade to where it becomes brittle and will break when pulled apart, just like a rubber band left out in the sun. When comparing acrylic latex with SBR latex as part of the concrete mix design, acrylic latex will be better for applications where there is direct sunlight. However, for a bonding slurry which is less likely to be exposed to long term UV light, SBR latex would be a more optimal choice for the strength of the final bond. Choosing the right concrete bonding adhesive for any particular job is a balance of UV exposure and water exposure that the patch (or concrete) will receive. 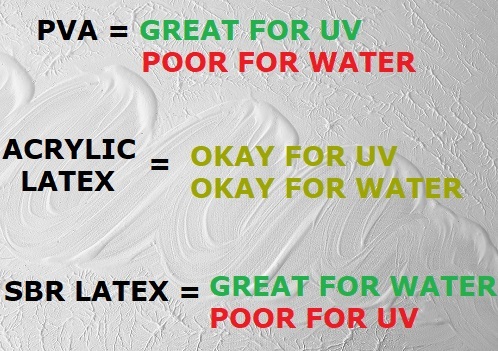 PVA is good for UV but bad for water immersion. SBR latex is great for water immersion but unable to be in direct UV contact without a protective layer like paint to prevent UV damage. In the middle, where both wet and UV exposure are a concern, is the acrylic latex product that is not as good as PVA or SBR individually, but able to be functional in all conditions. One of the many things latex does to a concrete mix is change the way that the mix holds water. Of particular note is that it is not generally advised to wet cure concrete modified with latex or with a latex bonding slurry layer. This is contrary to the traditional concrete curing process of keeping the new concrete wet for a month following placement, during which the first week is the most important. This is just one of the many ways that something as simple as asking "how do you bond new concrete to old concrete" can turn into this wormhole of technical information...truly this is barely scratching the surface of the ways in which these admixtures can be used to modify concrete and the limitations of each. Hopefully the sum total here has given you a greater appreciation for the process and hopefully a little insight into your own project or application. Fortunately you do not need to figure out everything on your own and if you think you have found the product that would be right for your concrete bonding needs, then by all means contact that company and ask them for assistance understanding how to use their product. Sand in bonding slurry - In the information above there is no mention of a sand to be used in any of the bonding slurry mixes. The addition of sharp sand to a bonding slurry mix will substantially increase the total strength of the cured slurry however this is not universally beneficial depending on the process and bonding adhesive you are using. Also, using unwashed sand, tumbled sand (play sand), isometric sand (magic sand) or simply the wrong proportion of sand (never more than 2:1 sand to cement powder) can all compromise the strength of your bonding slurry to disastrous result. The best possible advice that you can follow in terms of when and where to add sand to a slurry is to follow the manufacturers directions explicitly for the product you are using. Generally speaking, slurry made with PVA would be only portland cement, water and PVA, where acrylic bonding slurry usually would benefit from the addition of sharp sand. Again, please follow the specific directions from your product manufacturer and not these simplified guidelines. Concrete primer - There is only one area where I am partially in disagreement with manufacturers directions. If you are researching concrete bonding adhesives then there is no doubt that you will read in multiple places where the manufacturer tells you that you can use the product full strength, undiluted and NOT mixed into a slurry...just paint it on right out of the bottle. However there are multiple engineering reports that can be found online that talk about the potential for a failure plane to be created from direct application of bonding adhesive as an intermediary layer. This could easily be from improper application of the product during real world field conditions, but for my money I will always use a bonding slurry as opposed to full strength bonding adhesive. The only occasion that I would elect to use full strength bonding adhesive would be for commercial form work where painting the existing concrete with slurry directly before new concrete application is simply not possible, for an overlay on a smooth surface where a failure plane will exist anyway, or any of the more advanced epoxy based professional bonding adhesives which are reliant on the epoxy chemical bond deep into the existing concrete. Surface Roughness - In order to achieve a good concrete bond your existing concrete surface needs to be rough and specifically not smooth. A very smooth surface creates a failure plane between the layers. For extremely smooth surfaces you will need to mechanically scarify or chip with chipping hammers. In some cases the acid wash process is enough to make the surface rough enough for a secure bond, but if there is concern that your concrete is extremely smooth then you will need resolve this in order for your new concrete layer to bond properly. I am sure that by now you are appreciating the technical nature of concrete and your simple question of "how to bond new concrete to old concrete" and how it is really not a simple question at all. There are a LOT of different possible ways to bond concrete layers and a host of potential variables that all would need to be considered to make the most sound technical decision. This is why professional concrete workers exist, and there is no replacement for education and experience. 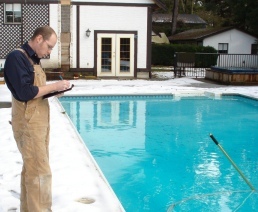 However if you are just a home owner (or pool owner) looking to improve your ability to bond concrete then you should now be far better equipped to tackle your repair job than before reading this. 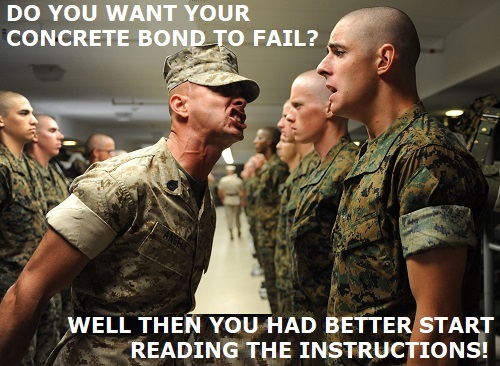 For even more technical reading you can refer to the ASTM concrete bonding standards page for more information about which products meet current standards for bonding new concrete to old concrete.